A cross between Slots and Bingo, with double the gambling addiction intended. Instead of someone picking up balls and calling them one at a time you get to spin the slots and look for matches or special items. Between the insufferable lag time and pointless game play I couldn't carry on past the first few stages. And to make things worse, it seems the main theme of the game is a clown, I despise clowns, everything about them is upsetting. Players click “spin” and match numbers to fill a slingo card. They can increase their score by earning balls and coins. Players get a “slingo” by matching five numbers vertically, horizontally or diagonally. Players can wager their points — the whole loot or just a percentage — and flip the devil vs. cherub coin to potentially win big or lose it all. 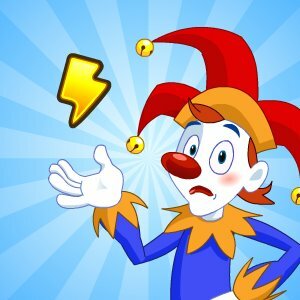 Players can gift others with power-ups or act as a Joker. Spin the slots and look for a match before the time runs out, however I've let it run out often and nothing happens, at least as far as I can see. Some achievement element per stage, such as filling your slingo card or reaching the score milestones will award rings but rings play no part towards game development. I don't know if anyone would actually enjoy this game, maybe someone who has a thing for clowns and winnable pretend gambling. 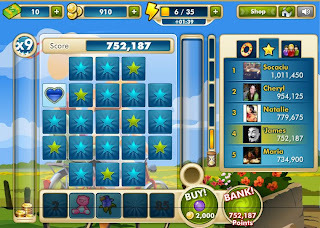 Honestly I don't think Zynga Slingo will be up and running for too much longer, to least for the sake of the developers and facebook users.